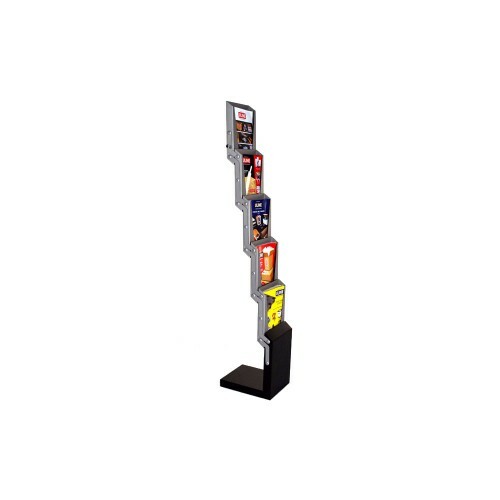 This stylish 5-Step Literature Rack holds literature even while folded, making portability even easier. Set up is simple: pull pegs on sides of rack, lift up to extend rack, and click pegs back into place. Displayed height: is 56" that collapses to 13"high when not in use. Comes with a convenient padded carry bag. Set up is simple: pull pegs on sides of rack, lift up to extend rack, and click pegs back into place. Holds 8 1/2" x 11" literature; 1 1/2" deep. Footprint 9" x 11 1/2"
Comes with a convenient padded carry bag.